Casa De La Familia, in collaboration with the Santa Ana Public Library will host a Human Trafficking Awareness Event on Saturday, January 20, 2018 from 1:00 p.m. to 3:00 p.m. at the Santa Ana Public Library. 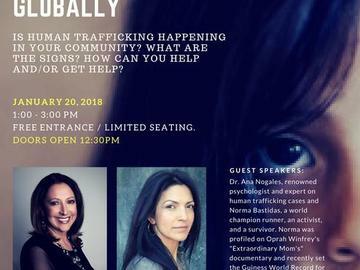 Guest speakers include clinical psychologist, author, playwright and expert on human trafficking, Dr. Ana Nogales, and celebrated ultra-marathoner, survivor and international human trafficking activist, Norma Bastidas. Doors open at 12:30 p.m. The event is FREE OF COST. The conference will kick off with a preview of Norma Bastidas’ documentary, “Be Relentless” and will be transmitted simultaneously in both English and Spanish. A meet and greet with Dr. Nogales and Norma Bastida will follow the conference.